The IBM 4610 Model TI4 is the high-function model, featuring MICR reading and single pass check handling. The single pass check handling function of the model TI4 improves operator efficiency. Because the operators are required to insert the check into the printer only once to perform MICR reading, check franking and check printing, they are free to attend to other customer needs like bagging items while these operations are completed, shortening the total transaction time. The SureMark printers provide the IBM RS-485 interface as implemented on the IBM 4680 and 4690 POS systems, and also the RS-232 interface. Because all these interfaces are provided on each printer, customers can choose the terminal platform that is best for them today with the knowledge that their printer investment is protected if they choose another platform in the future. In addition, customers with mixed terminal platforms can now roll out the same printer across their entire enterprise, thus enabling common printer training processes across the entire enterprise. The SureMark Model TI4 printer is designed for retailers who have implemented or plan to implement electronic journaling. There is no physical journal station in these printers. They are targeted to image-conscious retailers who require quiet printing at the front end of the store and need faster transaction times at the POS register. These printers will also appeal to retailers who wish to take advantage of an opportunity to market to their customers by using the printer's stored image capability for coupons and product logos. The TI3/4 has a new High Quality command designed to allow flexibility in the print speeds of the thermal receipt. The print speed of the printer can be altered by using this new command. See the 4610 User's Guide for additional details. 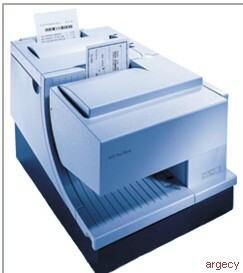 Model TI4 of the SureMark Printers includes Magnetic Ink Character Recognition integrated into the printer. MICR characters imprinted on standard checks in E13B or CMC7 format may be read by the printer for check validation purposes. The 4610 has an "auto switch" feature that detects which format is being used, and decodes appropriately. This is especially valuable where both types of formats are being used. A test check will be shipped with each Model TI4 printer. A magnetic head cleaner is recommended to maintain performance of the MICR reader. A package of 10 magnetic head cleaning cards (P/N 73G2600) is available as an accessory. Sources of electromagnetic noise (i.e. displays, security towers, etc.) can interfere with the MICR read head on Model TI4. The printer is equipped to filter the noise from many but not all devices. If the MICR reader does not function properly, rearranging the printer relative to the device may improve the MICR reading. The noise source should be located as far as possible away from the right side of the printer. The SureMark printers feature modular interface adapters including a standard RS-232 and a IBM RS-485* interface. The RS-232 supports 9600 and 19.2 KBaud rates. The RS-485* operates at a 187.5 KBit data rate and provides for transmission of both power and signal. 4610 Models TI3 and TI4 support modular interface adapters. This will enable customers to easily migrate to new technologies like USB, when they become available. Removal and installation of interface adapters is a customer setup operation. A single cash drawer port is also provided. Two cash drawers can be supported with a "y-cable". Because there is no physical journal station on the SureMark Model TI4, an electronic journaling application is required. Electronic Journaling eliminates the need to store paper journal tapes and the time-consuming task of searching paper tapes should the need arise. The SureMark printer model TI4 uses the same RS-485 interface as Model 3 and 4 printers. System Library Subscription Service (SLSS) is available by product number and subject code. Customers currently subscribing to SLSS will receive publication updates automatically. The following publications are available at general availability. A specify code is not required. Language will be determined by the plant based on the country code of the order. The specify codes listed below must be used when an alternative to the plant country default is required. Field Installable: Yes, with the Compact Cash Drawer, order P/N 10H3355.